Born at Lyons; died 1208; cult approved in 1907. Saint Stephen was born into the noble family of the Châtillons. He entered the Carthusians at the charterhouse of Portes, where he became prior in 1196. 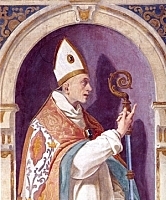 In 1203, he was consecrated Bishop of Dié.